Integrated and powerful control for demanding applications. The iQ-R is a full featured control platform with fast processing speeds, network and module synchronization, and multi-discipline control. The advanced design of the iQ-R enables users to lead their industries with superior machine performance and productivity. A multitude of CPU and I/O module options make it a flexible solution for a wide variety of applications. The CPU includes an internal database that can be installed into the SD memory card. This allows a selection of database commands that can add/delete/change records to be utilized for simple recipe functions. It is also easy to import/export Unicode files for use in spreadsheets. This is useful where multiple product variations are produced using the same machine process. The iQ-R boasts a high speed system bus for synchronized data communications between multiple CPUs. This improves performance and accuracy, especially for high speed motion control applications. CC-Link IE Field provides deterministic performance over Industrial Ethernet ensuring synchronization between nodes. iQ-R has a variety of security features to protect intellectual property and plant safety. Engineers can restrict access at the network level using IP filtering, lowering the risk of hacking or any other unauthorized third party access. At the controller level, security key authentication prevents unauthorized access to the program or execution of the CPU. Security keys can be registered to specific CPUs, personal computers, or an extended SRAM cassette. Use of an SRAM cassette enables CPU replacement in the field without the need for program changes. 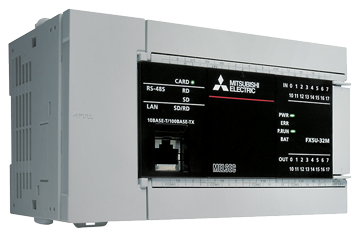 HTE Automation supplies Kansas, Missouri, and Illinois with Programmable Logic Controllers.